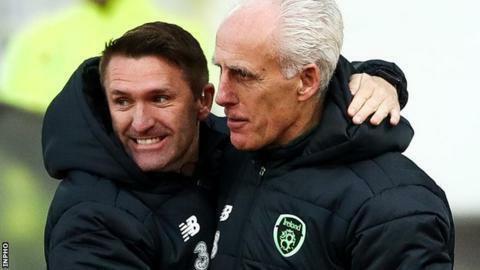 Republic of Ireland manager Mick McCarthy has described his side's 1-0 Euro 2020 qualifier victory away to Gibraltar as a "horrible game". A Jeff Hendrick goal ensured the Republic got McCarthy's second spell in charge off to a winning start. However, McCarthy admitted he was hugely relieved as he made no attempt to deflect from what was an uninspiring performance at the Victoria Stadium. "I pretty much hated every minute of that match," he told RTE. "We were never going to complain about the pitch, although it doesn't make it any easier. It was blowing a gale, but we didn't play well and Darren Randolph was probably man of the match with the save he made to keep it at 0-0. The former Sunderland and Ipswich manager started with Matt Doherty on the right wing, in front of captain Seamus Coleman at right-back, but he took the in-form Wolves wing-back off and suggested it is a tactic he will not be repeating. "It was an experiment that hasn't worked," McCarthy said. "I said he has been one of the best attacking wing-backs in the Premier League, but has he got a box of tricks to get by people? Probably not. "If you are a full-back then you are normally coming from behind the ball and maybe there wasn't much space in behind them when they sit in." McCarthy was more impressed with his central midfielders, Conor Hourihane and Hendrick, having spoken to the Burnley player before the game about scoring more goals. "I had spoken to Jeff about having only scored one goal in 50-odd internationals and we had worked on trying to get midfielders into the box," he added. "Conor is an excellent player and he played well also - they were both very good." The Republic's next qualifier is on Tuesday in Dublin when they will host Georgia, who opened their campaign with a 2-0 defeat against Switzerland in Tbilisi. "It will be a totally different game," added McCarthy, who led the Republic to the 2002 World Cup finals in his first spell in charge of the international side.